Don’t be afraid to take matters in your own hands. Sometimes the vendor provided icons don’t have the pizzazz you may be looking for. 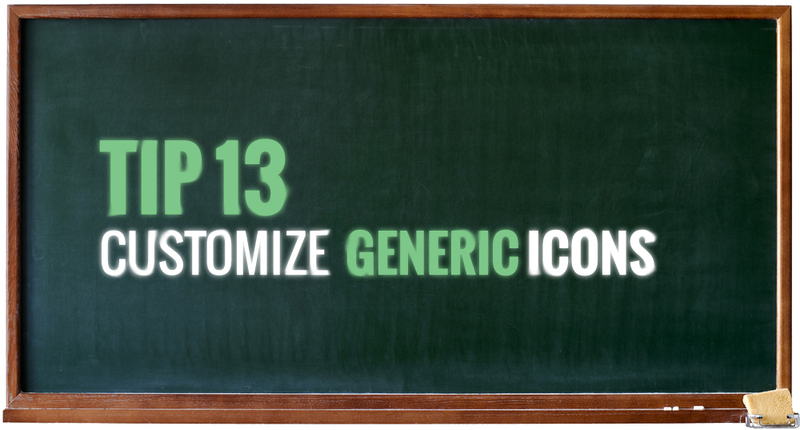 Create your own custom icon using a generic box along with a few elements of the piece of hardware you are copying from. Use a logo and brand colors to get the point across without over complicating the icon. 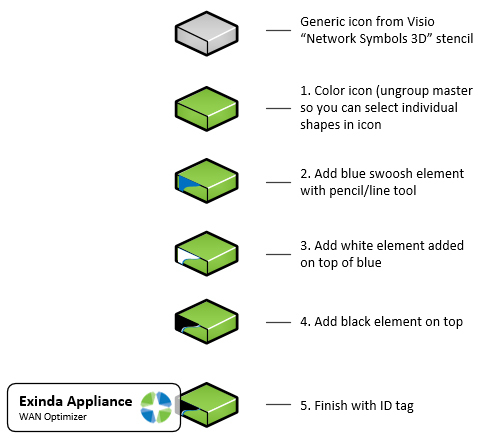 I needed a 2D icon for an Exinda Web Optimization appliance. I used an Internet search engine to find a picture of the model I wanted to make and used that as my inspiration. I started with a basic black rectangle (1U) and re-created the “swoosh” by combining 3 layers, each a different color. I offset each layer to create the banding effect. 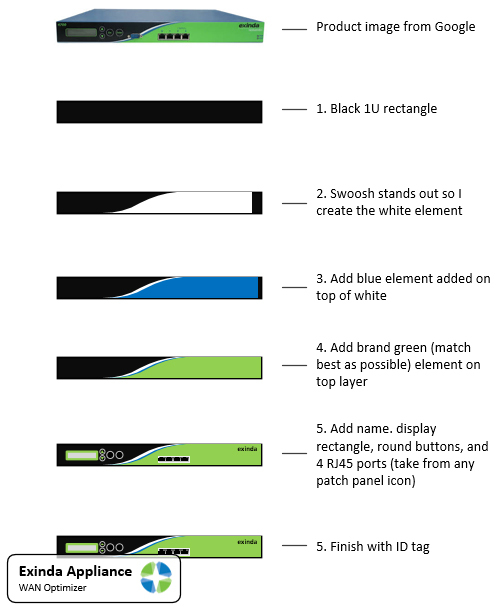 I focus on matching the brand color and elements that catch your eye like the control panel and RJ45 ports. Finish up by adding the manufacturer logo in an ID tag, and you instantly have a professional logo! 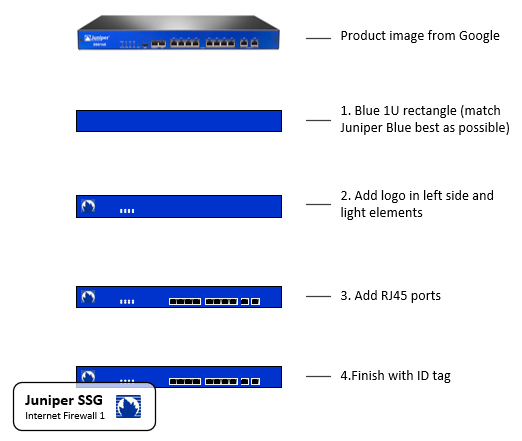 This is an example of a Juniper SSG Firewall. Like example 1, I started with a blue rectangle, added a logo, and RJ45 ports. You can poach the port icons by ungrouping other logos and copy just the port elements. Finish up with a tag and logo. 3D isometric icons can be difficult to find, so once you master this skill, sky is the limit. Start with the generic icon from the Network Symbols 3D icon pack that comes with Visio. Just like the other examples, make sure to match color and any other elements that grab your eye. Since the icons are small, don’t get too wrapped up into making it exact, it’s surprising how much something simple like color and a few key elements can make it identifiable. 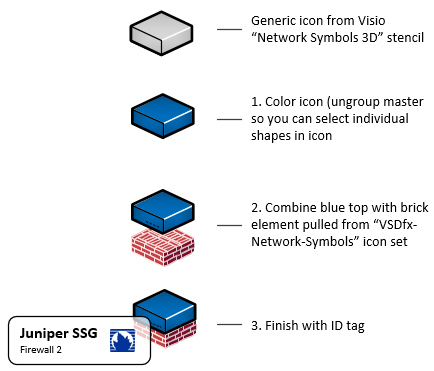 The last example is for a 3D Juniper SSG icon. Start the same wasy as example 3 with a generic box. Match the color and merge with a brick wall element borrowed from another isometric icon found on the Internet. Add a tag and logo.